Johnny V is in the house of Atlanta Georgia! I have arrived safely. Look out Atlanta! I've just re-visited the forum after quite a long time and its great to see your name still there. Have a great time in Atlanta. Nice to see your name and posts still there as well. Just checked into my room here at the Renaissance Waverly Hotel. Bumped into Higgy and SusanI down in the lobby when I was checking in. I have a 5PM meeting that I need to head out to. I will check back in with you later on. Thanks for the kind words. Wish you were here! Okay... now I'm sitting at work and getting seriously jealous.... Have fun, everyone, and post lots of pictures! It's still sort of quite, but a lot of people started arriving late today.. Saw BMT Barb, Rich Friend, and a couple of others who were here last year.. Missed Beth Marie though, and Lorrie too, we got back to the room too late... By the way, JV has pics already..
Marcia, and Cheryl, you should check out the conference program on the Amputee Coalition website, I think you will see quite a few changes this year.. They are offering several of the seminar's more than once, and added some new things... It' looks like it's going to be hectic, but fun too......and informative as well. What are we gonna drink now? What are we gonnal drink now? :lol: I loved the picture. MORE, MORE, MORE!! We've met BethMarie and Emma, and both are very sweet, although Emma doesn't say much at any point..
Susan I is making the speedy athletic rounds....what a dancer she is! We were able to briefly meet Annieruh, and her spouse. They were climbing out of the limo with JohnnyV and we were getting in..Johnny has been pretty busy. He's attending the same meeting I have been, plus helping out with the children on the new family tract so he is really busy... And by the way, he is catching flack for the fact that we can't stay logged in. Kep and Neal got him yesterday at lunch. Karen and Cheri have been here as well. They arrived on Thursday afternoon, and busily worked Stan's booth showing off their great legs. Last night, everyone walked across into the park and enjoyed meeting and catching up with all of our friends. It was a beautiful southern evening.. unfortunately, the had to leave today, so they won't be here for the luau. Jerry played for us some on BMT Barb's banjo. We even were joined by some of the new young ACA staff.. They're a riot. Very nice people. The one person we haven't found yet, is EBTalley.. Wasn't he coming? The rest of the gang, Marcia and Don, Cat and Ruth are missed sorely... Cat getting the giggles, we all miss the laughter of him and Ruth. Marcia, you and Don will miss our picture tonight. I am getting ready to check out of the hotel. Sorry that I didn't have the usual time to take and post pictures. I am sure that some will surface later on. Will check back in with you all on my return home. Well, it's all over again for this year, and folks are really tired this time.. It's Five String pickin on BMT Barbs banjo....It was nice to hear him play. Bluegrass is a favorite. Everyone seemed to congregate out side that evening.. It was the perfect southern evening.. I have a video of these gals that I'm going to post as soon as I can figure out how. They were a hoot. I even did the bottle blow and sure enough it just sounded like bad breath. I also made Cat, Ruth, Marcia and Don proud by partying heartily Fri and Sat nights. I drank enough for all of you til 1AM and 2:45AM respectively. I didn't need the puke bucket, but I still feel drunk. My hair won't even lie down. I don't do wine anymore Cat and Marcia, and I only tasted Barb's concoction called Captain Onassis (you'll have to ask her for the recipe), but I did inbibe my fair share of Jack and coke along with beers. It was quite a hoot. Barb's concoction was the hit of the party. She could bottle and sell that stuff. We had a lot of drunken amps due to her. Needless to say we had a great time. Those of you who couldn't come were missed, but we got over it! LOL I'm already for next year. Once a year for 3 days isn't enough time. I have too many friends to count at these conferences. I already miss everyone. My inside sources say that 2010 will be west coast. Maybe San Diego or Las Vegas. Whohoo!!!!!! Oh, YES!!! Come west, ACA, come west! Without airfare to worry about, that would mean I could DEFINITELY come! Put in a good word with your "sources," Neal! After being in Atlanta for three years straight, they want to go west. Maybe not all the way west, but westerly. It is just a rumor. I won't hear anything definitive before anyone else. I don't have that kind of influence. I do have some suggestions for Vicki from what I heard in all my networking and socializing. The hotel in Atlanta is probably the best hotel I've been to, but it sprawls too much. Too far for some amps to walk. Way too far for wheelchair users to roll, just ask KEP. A large hotel that has a more compact design would be more efficient. Even I dreaded the walk back to my room for anything. It is quite a haul. There was a page on the conference evaluation form asking about how we liked multiple years in one location and also where we would like to see the conference in years ahead. I guess it could stay east if the majority request it. If it were to be held in one location for multiple years again, I think it should be the middle of the country. Better access for everyone. The west coast wasn't represented as heavily as the east and mid states. That makes sense because of costs. Just my two cents worth. If any of you have suggestions about future conferences, let the ACA know. I was told they file everything for future reference and they do refer to them. The conferences have grown so much and continue to grow. They need the input. I would like to see everyone having fair access to a conference. They are awesome experiences. 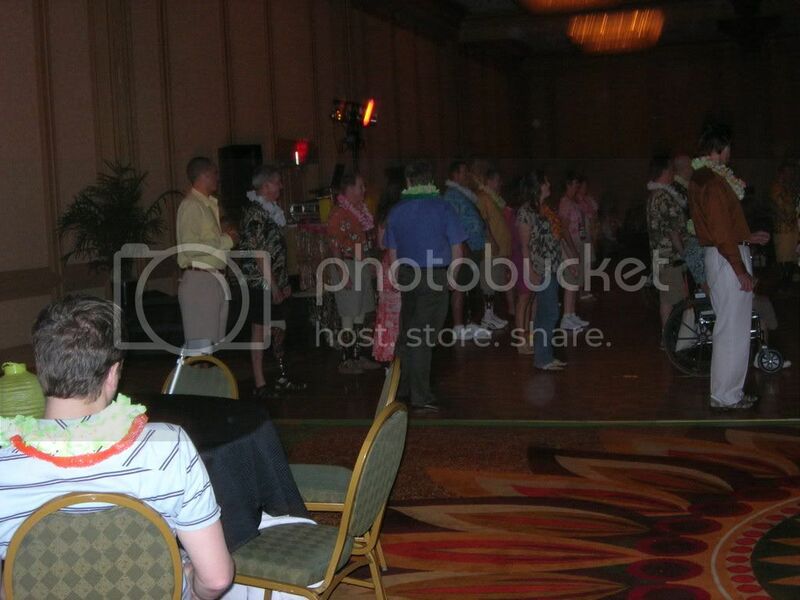 These two pics are of the dance classes group dance at the Luau Dinner/Dance. These three gals played choo-choo train the whole weekend. I'm the second from the left in both pictures. 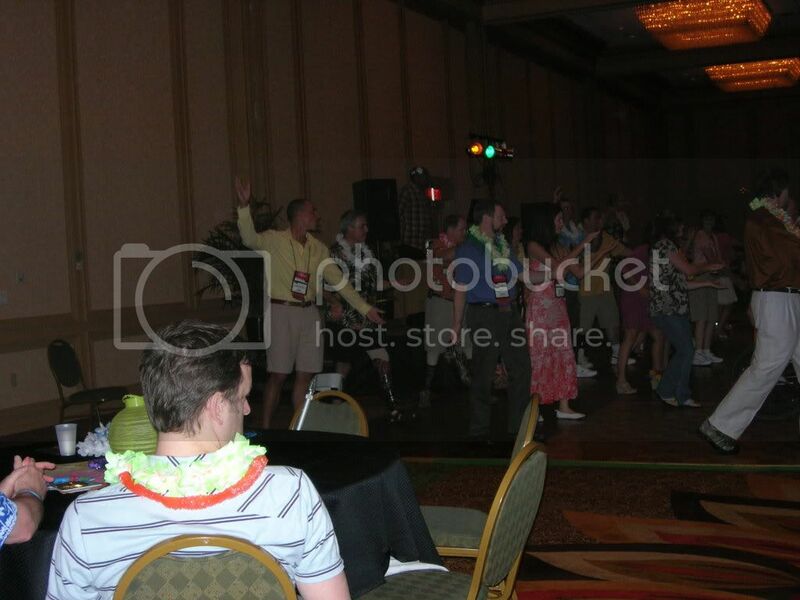 The one in black with the white lei. Another awesome conference! Was so great to see "old" friends, dearly missed the ones who couldn't make it, and love the new friendships made. If there's anyone reading this thread who is undecided about attending an ACA conference, please just give it a try- you won't regret it!